The formula of the yacht charter with crew, skipper and hostess, offers a great service to its pampered guests so they can fully enjoy the sailing holiday without thinking of anything else and so completely relax. The two person crew (from mid June to mid September) will take care of everything on board: from sailing to cooking and cleaning. Food will be stored on board before boarding. If the guests, as it often happens, want to become involved, they will be welcome to help haul in or or slacken the main sheet or even take the helm. Meanwhile those who are a bit lazier may relax sunbathing, reading, chatting and taking photos. Cooking is our winning card on your sailing holiday on board Penne Bianche. 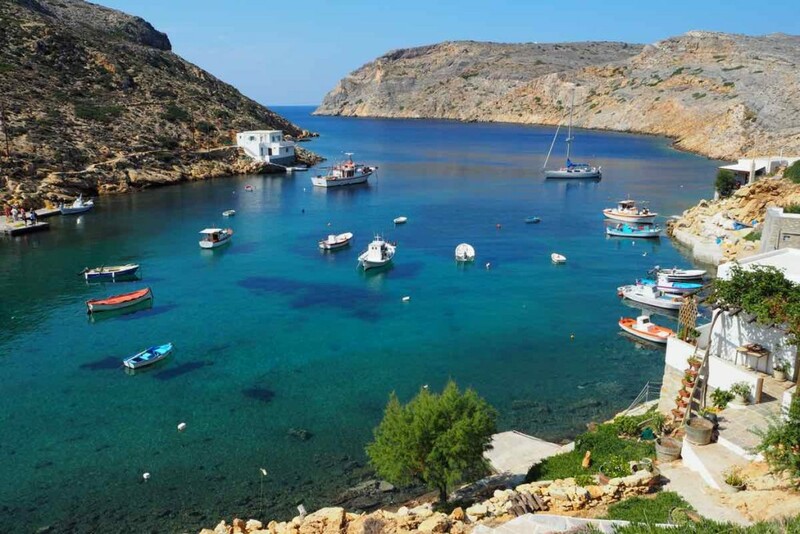 Sailing, visiting amazing places and enjoying a true gourmet cuisine makes the sailing cruise a really unique experience. 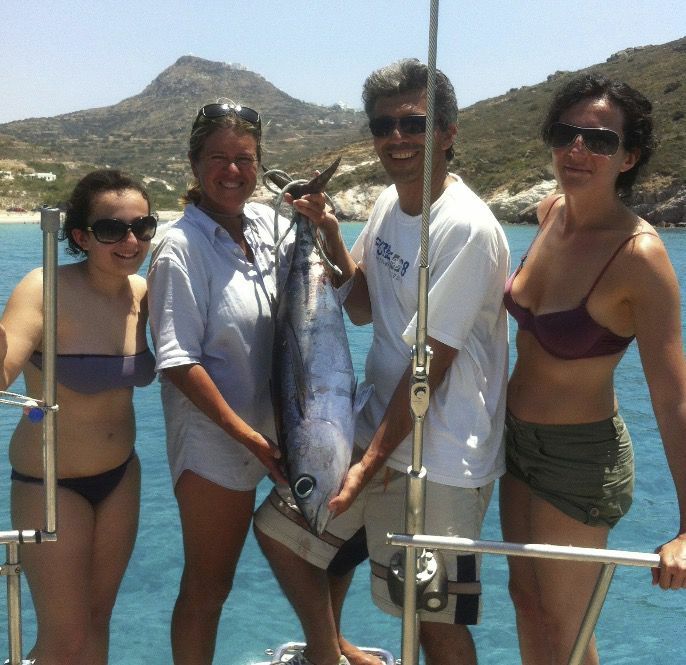 During low season, (till mid June and after mid September), the skipper is still the cook on board and the guests contribute to the onboard duties and this is an opportunity for understanding the philosophy of boat-life, getting to know the various aspects of sailing and, maybe one day, being able to sail a boat by themselves. 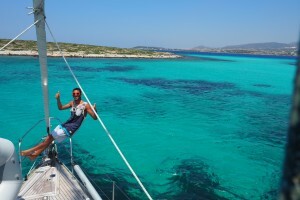 Sailboat charter can be booked per cabin or the whole boat with exclusive use. 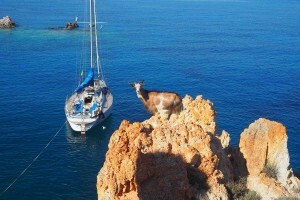 Book your sailing holiday among the Greek islands: comfort and a professional crew ensure a dream cruise!! 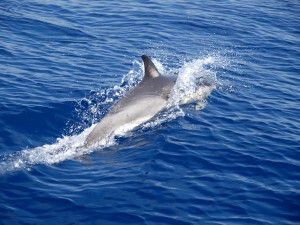 The skipper organizes the itineraries according to the weather conditions and the wishes of the guests choosing an itinerary that will include day by day a number of interesting places to visit. With a small group of guests instead of a crowded boat there will be time to organize the day nicely and smoothly, sailing from one island to another, dinghy trips for visits ashore, lunches and dinners in the cockpit will be more comfortable. The crew will be waiting for you to have a wonderful holiday on a sailing boat to discover the breathtaking bays of Greece.